The foundation stallion of my preservation program. Pictured at age 16, enjoying himself in the pasture. His natural beauty, athleticism, wonderfully intelligent mind and willing temperament led me to focus on the preservation of this nearly lost line. Almost 25 years later I continue with his only 3 registered grandsons. Thank you for visiting our online home! 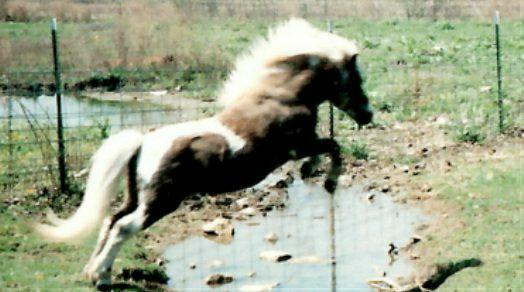 I have been breeding select quality American Miniature Horses since 1994. My focus since about 1998 has been preservation of foundation show bloodlines that have proven their quality and consistency, and tended towards Morgan and desert Arabian type. I love a horse that exhibits balance, refinement, and a natural beauty due to correct conformation. I also want enough substance to be usable, the mind to achieve it, and a willing temperament to work with. A horse that can be a partner, whether that be in the show ring, therapy work, or a companion to go driving or hiking with. I found all of these qualities to be very consistent in the few Winks Miniatures that were left in the mid to late 1990's, and decided keeping those bloodlines alive would be my niche. To my knowledge, my farm now has the greatest concentration of Winks lines in Miniatures, carefully crossed on other lines I also fell in love with- FWF Little Blue Boy, X'Caliber's Little Navajo, Bond Showboy, Gold Melody Boy, Chocos Little Specks Red Boy. There are a few other bloodlines I would love to add, and perhaps one day I can. Breeding is like lace-making...careful weaving back and forth to create intricate beauty. The website is currently under construction. I will state up front, 99% of my horses DO NOT have professional pictures. They have "single mother, usually with no or untrained help, and shaky hands, doing her best" pictures. I hope one day to be able to fit them up and get professional ones. For now, I am choosing from the pictures that I currently have, the ones that I believe showcase their traits the best, even if they are wet from a bath and unclipped, or the background isn't what I wish. I do not hide my horses, what you see REALLY IS what you get. I hope you enjoy them as much as I do. This is a passion for me, and I am proud of the breeding program I have developed over the past 24 years! ​ Much more information will be available on the various pages, and the historical section and articles page will continue to grow, so visit often!